The trolley seat insert from Fred n Benji is a really clever, yet ever so simple, piece of kit that fits on the majority of supermarket trolleys. 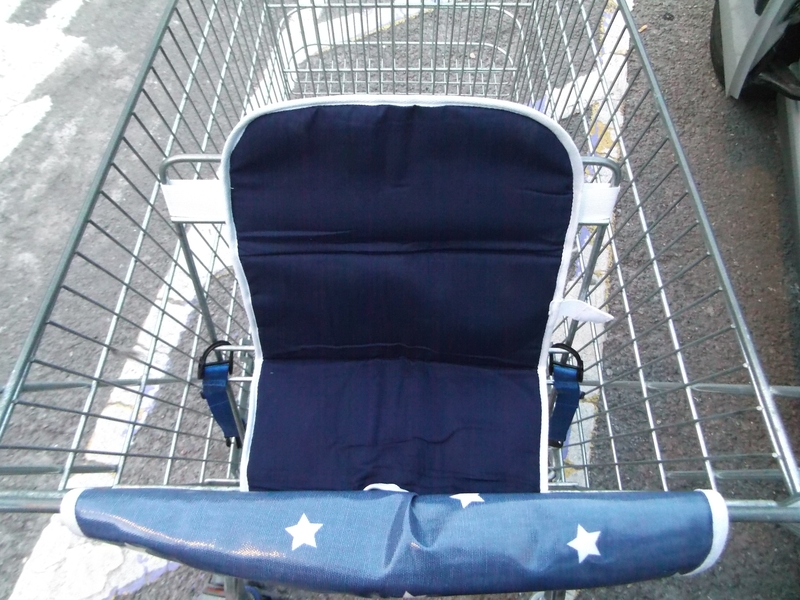 I did find the elastic quite a tight fit on the Tesco trolley seat but I know they stay in place without having to use the elastic too. Although it is designed for the toddler seat the insert will also fit inside the baby seat, so no need to worry about putting baby onto cold, hard plastic, or trying to get a blanket to lay flat. The outer is waterproof and wipe clean, so you don’t need to worry about having to wipe the seat down and the other side is nice and soft against your little one’s skin. The seat insert also comes with a matching handrail cover. 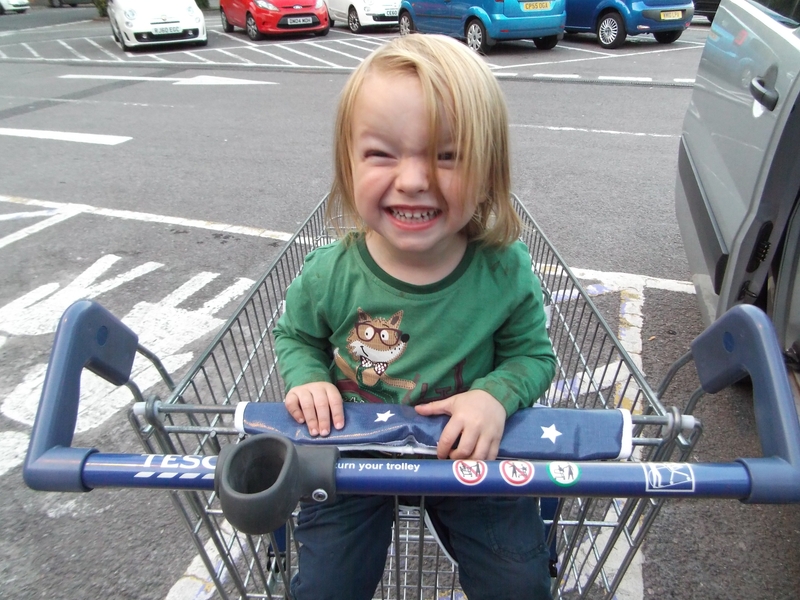 Our trolley had the holder for the handheld scanners so the cover didn’t really fit, but I put it over the piece of metal just in front of the seat (it even covered the bag hook) and O was really happy pointing at the stars as we shopped. Plus it stopped him trying to get his hands stuck between the bits of metal! 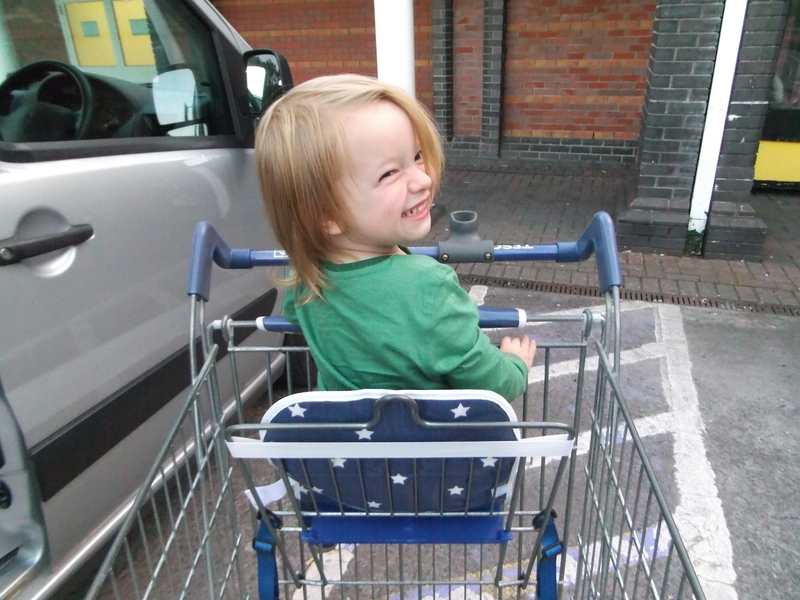 I think you can tell by his big grin just how much O loves his new seat insert! He was less than impressed when we went the next time and I’d left it at home. Needless to say it has stayed safely in the car ever since! Both the seat insert and the handrail cover fold away into a small matching pouch that can fit neatly inside a changing bag, large handbag or glove box in our case. If you have little ones, I strongly suggest you follow the Fred n Benji Twitter and Facebook accounts to keep up to date and find out when the fantastic trolley seat insert goes on sale in the shops! This is amazing! How has this only just been invited?! SUCH A BRILLIANT IDEA!! !